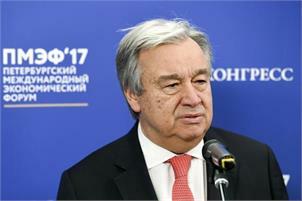 United Nations : UN Secretary-General Antonio Guterres has welcomed the return of Indian Air Force pilot Abhinandan Varthman from captivity in Pakistan and called on the two countries to sustain the “positive momentum” and engage in further constructive dialogue. “The Secretary-General calls on both parties to sustain this positive momentum and engage in further constructive dialogue. His good offices remain available should both sides agree,” Dujarric said. Varthaman’s release was being watched with bated breath across India as the IAF pilot was accorded a hero’s welcome as he crossed onto India through the Wagah Border. The IAF pilot’s release was seen as a major step towards defusing a near-war situation triggered by India’s retaliation over Pakistan’s continued support for terrorism.